Word just in, a new Bicycle Derailleur Patent issue (March 20, 2018) for work we did a few years ago. 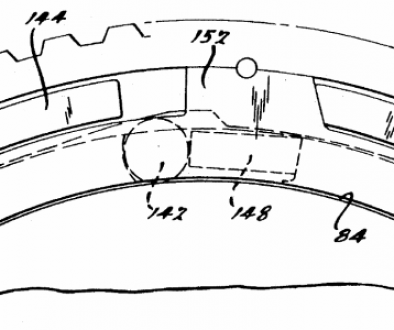 One of two passed this week through the patent office and added to the growing Patent List. 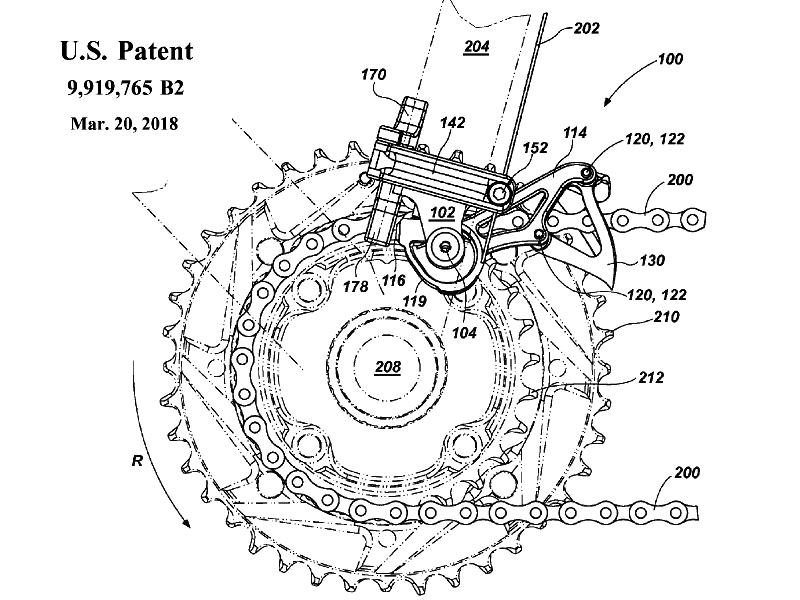 This patent covers a new mechanism for shifting with bicycle front chainrings. 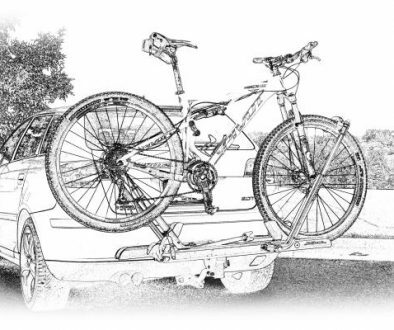 The patent also claims the Dual Sided Chain Catcher — first raced at the 2016 Tour de France. 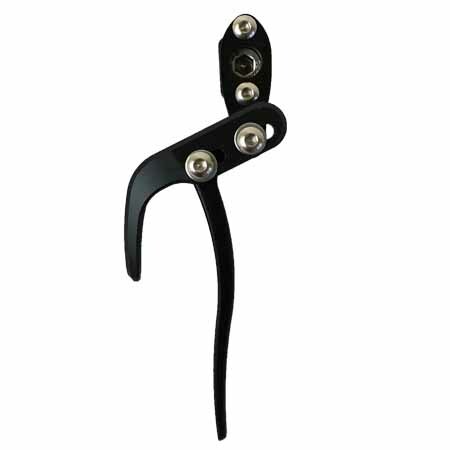 Shifting with the new mechanism is different than with traditional bicycle front derailleurs. Instead of pushing the chain side to side, the new mechanism “lifts” it from a smaller gear to a larger one. Very cool action as tested in prototype, and very quick response. Coupled with the also patented Radical Ramp Technology (that we were involved in creating), the shifts are fast and accurate. It’s hard to see the full scope of action with this one image, but download the PDF and see the whole thing if you want. Also see our post about Chainring Performance for a more complete view of the engineering in action. At the time of inventing the above bicycle derailleur, I also reflected on other ways to fix some shifting issues. Really, if the chain comes off, it’s most likely an issue with setup (bicycle derailleur alignment), but it does happen. So, the dual sided chain catcher is a way of compensating for a less than perfect setup, or less than perfect shift technique. The most famous chain drop was on stage 15 of the 2010 Tour de France as Alberto Contador attacked Andy Schleck. That said, we thought it appropriate to launch the new device at the 2016 Tour de France. The photo (right) is a Lotto NL-Jumbo team bike with the Sentinel installation. The chain catcher is very simple, and also very simple to setup and use. Below is a video we did for WickWerks talking about setting it up. (Yes, that’s me in the video.) Now this mechanism is in the above patent. At the time of introduction, the Sentinel sold out quickly. Since then, Synthesis finished the contract with WickWerks, so I’m not sure where they’ve gone with it. Contact them for more information. 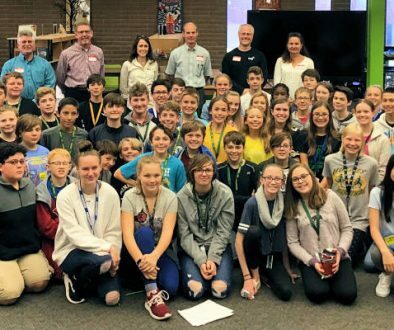 The single pivot bicycle derailleur was to launch 6 months ago (according to the owner who thought it was no big deal to finish), but that has yet to see the light. When it comes, the patent is now in place. 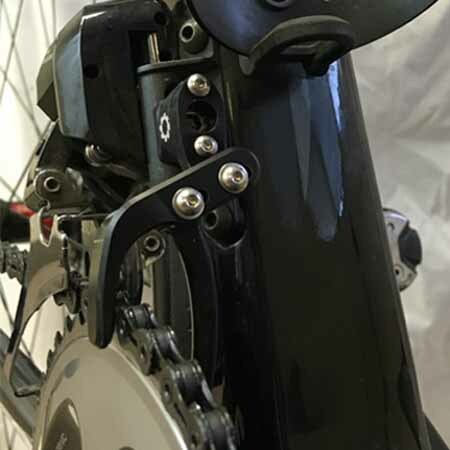 When you’re ready for creative assistance with your products — whether a bicycle derailleur, or something completely different — we’re here. At Synthesis we specialize in engineering with new ideas. And, many of them end up with new patents just like these. All of this is from the creativity right here at Synthesis. Let us know when you are ready?